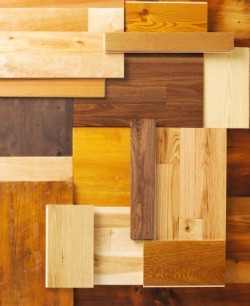 There are a multitude of flooring types on the market. Understanding the main criteria involved in selecting the one for your home will play a decisive role in your long term experience with hardwood flooring. The manufacturing process, type of finish, installation method or pattern chosen for your floor will all play a role in the final look of your home as well as the strenght of your floor. Let's take a look at how wood floors are being categorized and why. Engineered flooring: Developed specifically for condominiums, this type of flooring was designed to combine the beauty of hardwood floors with the increased resistance to environmental changes. It is made out of 3-5 different layers of wood, glued to each-other in an overlapping pattern. This type of manufacturing ensures that, under the pressure of environmental changes, every layer will tend to move in the opposite direction with the one next to it, therefore keeping each other in place with the end result of having the most stable type of wood flooring on the market. If you are researching flooring types in search of a stable flooring material, engineered is the best choice out of all the flooring types. Solid flooring- Made from solid planks of real hardwood, solid flooring has been around for centuries. It consists mostly out of random length boards, with a thickness of ¾ '' and widths varying from 2 ¼ '' all the way to 12''. Elegant, durable and versatile hardwood flooring is, still, the most looked after type of flooring between buyers. Unfinished flooring, it is a type of flooring that will require site finishing It is cheaper than its alternative, but its cost of installation will be higher than the one required for prefinished, because of the extra sanding process involved. This type of flooring used to be exclusively, regular, solid hardwood flooring. With the technological advances made in the last few years this is not the case anymore, unfinished wood being available both as engineered and solid hardwood flooring. If borders, designs or inlays are the reason for your "flooring type research", I recommend going with the unfinished option. Prefinished flooring- is a type of flooring that was factory finished, therefore requiring only installation without the need of site sanding and finishing. The installation of a prefinished floor it takes shorter overall, than unfinished flooring, but this type of flooring won't allow you to customize it much. 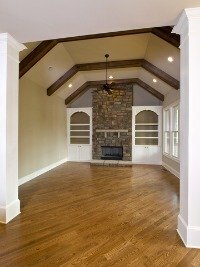 If you are interested in upgrading your floors to wood flooring, but are not willing to put up with the mess associated with some of these projects, prefinished is the recommended flooring type. The direction of floor installation is probably one of the most overlooked aspects of all. Still, the choice you are going to make in this department it will drastically affect the look of your house, once the project is completed. Let's take a look at your options. Straight flooring installation is the type of installation that ensures the positioning of the floor either parallel or perpendicular to the longest wall in the room. This is the most affordable way to install a floor, because of the fairly small waste factor. Angled installation represents the type of flooring installation in which the boards are positioned on a less than 90 degree angle in relation to the longest wall in the room. When told about the angled installation type, most of the people picture their floor installed on a 45 degree angle to the longest wall. While this is the case in many situations, the angled installation is not limited to a 45 degree position. Herringbone – represents the installation pattern in which the boards are all one size, usually 1 or 2 feet long and are being installed in a zig-zag pattern. Parquet flooring – represents the installation pattern in which the floor is being installed in a repeated pattern, with the end result, being, a checker board looking type of floor. Borders - All of the installation types mentioned above can be enhanced by surrounding them with a border around the edges. The options you have, in this department, are infinite and most of them will produce incredible results for the look of your home. Inlays – represent custom made pieces of flooring that are being inserted in the hardwood floor with the intended scope of highlighting a certain area of the room. There are many ways to install a floor and choosing the right one for your home and floor type is very important. Floating floor – represents the type of installation in which the boards are literally floating on top of the subfloor, without being nailed or glued to it. One common misconception about floating floors is that, they are not durable enough, another one is that this type of installation can only be performed in case of engineered flooring. This is nothing more than a false theory, kept alive by the numerous contractors that simply don't know any better. Nailed down floor-floating subfloor combination- is an installation type of flooring, used mostly in the high rise buildings, where nailing into the existing concrete subfloor is prohibited and the issue of sound traveling is being brought up. Just as the name describes, this type of installation, implies the creation of a floating plywood subfloor, consisting out of two layers of 3/8'' plywood, screwed and glued together in an overlapping pattern on top of which the hardwood flooring is being nailed. The floor installed using this method will offer a high sound-proof barrier for the units below. Glue down floor – Represents the type of installation in which the floor is being glued to the subfloor. Because of the elasticity factor of the glue, that will allow a solid floor to move excessively when exposed to environmental changes, I only recommend using this type of installation as a method of installing engineered floors only. Nailed down floor – Probably the most common type of installation type represents the process in which the floor is being nailed down to a wooden subfloor, using either staples or cleats. Nails-glue down combo – is a process in which the floor is being installed using a combination of glue and staples. Many contractors avoid this type of installation because of its high material and labor costs. Yet, this is the most durable, type of installation. So, understand your options, consult with your contractor or interior designer and make an informed decision. It can make the difference between a floor that lasts forever and drastically enhance the look of your home or one that will last a short time creating only problems to you and your family.